A commercial ship flying the Italian flag, and carrying dozens of rescued migrants, was refused permission to dock at Italian ports. The Vos Thalassa, a supply ship which serves oil rigs in the Mediterranean, rescued 66 people adrift off the Libyan coast, Italian media report. After being turned away from Italian ports, it handed the migrants over to the Italian coastguard. Italy’s government has blocked charity rescue ships from its ports for weeks. Senior officials have accused the humanitarian groups of operating a “taxi service” for migrants, which they say endangers lives by encouraging human smuggling. 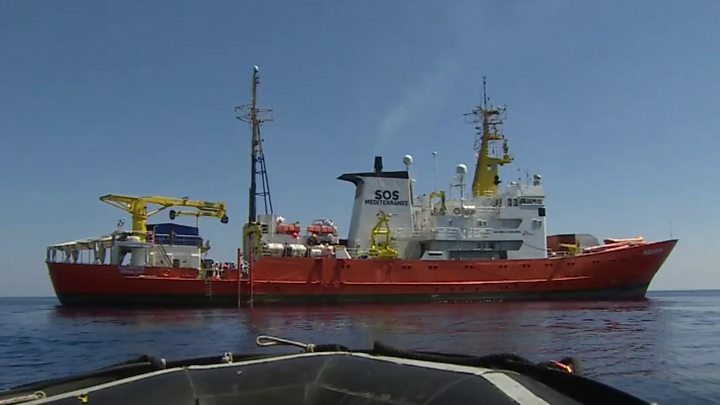 The Vos Thalassa, however, is an Italian vessel, rather than a foreign-flagged charity ship, and was not specifically on a search-and-rescue mission. It is the first time a private Italian ship has been blocked from the ports of its home country because of the migrant policy. International maritime law requires any ship that encounters an emergency to make its way to the area quickly and offer assistance. 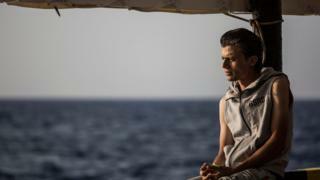 Italian officials, however, said that the Vos Thalassa did not need to intervene, as the Libyan coastguard was on its way. Italian media quoted officials saying that the Libyan coastguard was closer, but the Vos Thalassa chose to travel to the ship. Italy’s transport minister, Danilo Toninelli, tweeted that he was proud of the coastguard for taking on the migrants “who were endangering the life of the Italian cruiser Vos Thalassa”. He said there would now be an investigation to “punish troublemakers”. The Vos Thalassa was also involved in a similar incident involving 212 migrants in June. Italy’s hardline new policy on rescue ships comes from its new government – a populist coalition of the anti-establishment Five Star Movement and right-wing League. Interior Minister Matteo Salvini, from the League party, promised to take a tough stance on migration during the campaign. Since June, there have been several major diplomatic rows over the fate of migrant rescue ships bound for Italy – traditionally a first port of call for charity ships carrying those found at sea. The Aquarius, carrying 629 people, was refused entry to Italy, and was stranded in the Mediterranean for days while European politicians argued over its fate. It eventually docked in Spain. A second ship, the Lifeline, was also refused when it sought to dock with more than 200 rescued people. It eventually docked in Malta, but was impounded by authorities. Its captain faces charges of breaking international law and entering Maltese waters improperly – charges that he denies. And the Open Arms, run by a Spanish NGO, was also refused permission to dock earlier this month with its 59 rescued passengers. It returned to Spain. Media captionWhy is the Aquarius migrant rescue ship empty? The hardline stance on the Vos Thalassa is the latest firm statement from Mr Salvini, and it comes ahead of Wednesday’s meeting of EU interior ministers to discuss migration. Germany is also grappling with the issue, as Chancellor Angela Merkel’s coalition has faced down a row that threatened to pull it apart. Her interior minister, Horst Seehofer, is keen to strengthen Germany’s borders. On Tuesday, he unveiled what he calls a “migration masterplan” – including proposals for temporary checkpoints on motorways from neighbouring countries, from which there is usually free travel. He also wants to take a tough stance on the small number of refugees arriving in Germany from other EU countries where they have claimed asylum – and wants to send them back. That, however, is unacceptable to his Italian counterpart, Mr Salvini. He told Italy’s Il Messaggero newspaper that he would stop any such return. Italy instead wants a focus on securing Europe’s external borders – and eliminating the problem of unwanted migration at its source.